Easier than it sounds! You will master them in just 30 days! Finding resources of great quality to learn Romanian is not easy! That's why VocApp decided to use it's language force to create the ultimate Romanian language courses for those who wish to speak this beautiful Romance language. Our linguists developed many free Romanian lessons and special Romanian courses that include the most frequently used words for you to learn to speak Romanian! Ready for the challenge? Learning Romanian is easy and fun! Our flashcards make everything simple: you see a picture of the word and remember it, then the Romanian to English translation will explain the word, the sentence will show the usage and introduce you to the basic Romanian grammar, the audio will teach you the Romanian pronuntiation and voila! Your Romanian vocabulary grows day by day and you start speaking Romanian! Of course, all that is possible with at least a 5 minute daily effort from you and great flashcards from us! Moreover, you can download the course and use it as an Romanian audio lesson! Do you still have any doubts VocApp is the best way to learn Romanian? We think no! In this Romanian course you will find a Romanian word list of the most common words of this language. 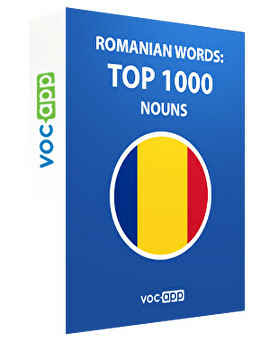 It will introduce you to the top 1000 Romanian nouns and enrich your Romanian vocabulary. The most frequently used words we chose will help you express yourself freely and form sentences. There are many more Romanian language courses we have for you, like Romanian Words: Top 500 Verbs and Romanian Words: Top 300 Adjectives. Proceed to them after finishing all of the flashcards with nouns. Everything you need for your dream to speak Romanian to come true is ready! Start learning Romanian with VocApp and you will soon impress the natives!"